Spend any amount of time on Twitter — even just 8 seconds or so — and you’re likely to come across some extreme negativity. Some of it is just an accurate reflection of the times we live in, but a lot of it is unnecessary and out-of-left-field anonymous vitriol. Athletes are in the cross hairs of plenty of the most vapid and hurtful critiques from the fringes of egg avatar Twitter, particularly if they have the temerity to lose a game, make an error, drop a pass or some other such thing that happens all the time even when everyone is trying their hardest. The worst of these “mean tweets” are so vile that they aren’t worth digging up, while the dumbest involve some sort of unoriginal GIF — those few-second clips that have somehow become an unofficial language for those unable to articulate thoughts with words. Against that backdrop, you might find the video I’m about to show you … refreshing? Maybe uplifting? At least amusing? See, on a recent episode of Vikings Connected, hosts Chris Hawkey and Erin Newburg had Vikings players read actual tweets that were sent to them. 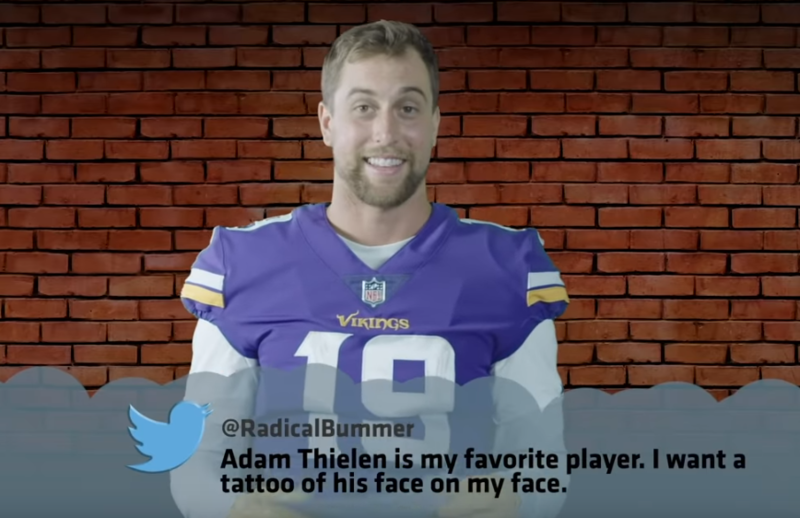 But instead of having them read MEAN TWEETS, as has become the custom on Jimmy Kimmel Live, the Vikings players were instead asked to read positive tweets that they received. Not every one is a gold mine, but there are enough good ones to make watching it very much worth your while — if for no other reason than to remember that not everyone on social media is a jerk and that some fans just want to give a shout-out to their favorite players.